This time last year the Bobcats played #13 ranked John’s Hopkins and lost by a score of 8-1. Since then Johns Hopkins has improved, bringing in the #2 ranked recruiting class for D3 with 5 starting freshman. In that same time frame, their team rank has gone from 13 to 4. The Bobcats graduated one lineup player and replaced him one first-year starter in Pierre Planche. Essentially, we are the same team as we were last year in terms of personnel. But as we learned in the women’s match against MIT, matches are not won by rankings or on paper, they are won through hard work and guts on the tennis court. Both teams came fired up to play in doubles and the energy was felt throughout the building. The Bobcats drew first blood at #2 doubles. Timmy and Pierre cranked serves and crashed the net, applying constant pressure and coming up with sick reflex volleys for the 8-3 win. At #3 Peter Yanofsky and Kyle DeSisto make for an intimidating pair. At 6’7” Peter brings his serve in the high 120s and at 6’3” Kyle’s isn’t much slower. Again they brought great energy and after 7 games there had been 7 holds. Up 4-3 Peter and Kyle moved through their returns and just let it fly, ripping the ball through the middle and crashing the net for the break 5-3. The Bobcats continued holding and at 7-5 Peter hit 3 unreturnable serves to close out the 8-5 win. At #1 Matt and Rob returned well from the start and got an early break 2-1. They really served well and got a lot of free points from it. They got another break and never let up on a single ball, winning the match 8-4, putting the Bobcats up 3-0 for the fourth straight match. Due to court time restrictions there was an hour break between the doubles and singles. On the verge of Bates biggest win in Men’s history, the team stayed focused on the task at hand and didn’t get satisfied with the sweep. There was still a lot of work to be done against arguably the best singles line up in the country (Hopkins was down 3-0 to the #5 team and swept all 6 singles to win 6-3). Johns Hopkins got their first points at #4 and #6 in two hard fought matches. Senior Warren Elgort, #36 in the nation bested Jeff in a close 6-2 6-4 match, and Kyle lost a break in each set at #6 6-4 6-3. At #2 Captain Matt Bettles continued to lead by example. Playing #40 ranked Ben Hwang, Matt used his experience and toughness to gut out the win over Hwang. In the first set Matt served big and took advantage of his one break point. Like every other point, Matt ran his hardest on every ball, but this point was amazing. After a long rally Ben had ripped a sharp angle and attacked, sending Matt outside the doubles alley. Ben angled the volley to the open court but Bettles took off and with a last ditch effort reached the ball and ripped a winner down the line for the break. This point was indicative of the entire match. Both were playing at a high level but Bettles will and determination were too much and he gave Bates its first singles point 6-3 6-2. At #1 Timmy Berg played a battle of a first set. Both players broke each other just once and it was decided in a tie-breaker. The match featured #27 ranked Tanner Brown who possesses excellent foot speed and is very consistent vs Timmy Berg with his big serve and attacking style. The first set was completely even and was literally decided by two points as Berg rose to the occasion and won it 7-6(7-5). In the second set Berg’s serve and forehand were too much. He has worked on his conditioning so much that he can still crush serves late in the match and that was the difference in the second set as Timmy took the match 7-6(5) 6-1. At #3 Rob jumped his opponent from the start. Still cracking his serve from doubles Rob was able to get a couple easy holds and then constantly applied pressure on return games. He was incredibly focused and for the first set played flawless tennis. Hitting the ball heavy and deep in addition to attacking every short ball Rob took the first 6-1. In the second set his opponent Jensen Reiter fought back and pushed the second set to a tie-breaker. At this point Rob showed his experience and took over. He brought his serve every point and looked for the opportunity to pressure his opponent. Rob handed Jensen only his second loss of the season (the other to #18 Hayden White 6-4 7-5) in the 6-1 7-6(7-2) match. At #5 Pierre Planche was down big. He had played a good first set but come up just a few points short 7-6(7-3). In the second set Pierre found himself down 5-2. But he made a big adjustment and committed to really ripping the ball and going after his shots in safe, directional targets. He stayed composed despite the deficit and was clutch on the big points, winning the next 5 games and the set 7-5. In the third set Pierre never let off the gas and had clearly found his stride, taking the match 6-7(3) 7-5 6-2. It was an awesome weekend for Bobcat Tennis. The team brought energy and big serves in every match and continued to improve. They controlled everything they could the best they could and the way each individual fought for every ball on every point is what allowed us to be successful on the scorecards this weekend. At #1 doubles Matt and Rob went after their serves and returned big through the middle. They played with lots of energy and won their fourth straight match 8-3. At #2 Timmy and Pierre hit bomb serves and put incessant pressure on their opponents in an 8-2 win. At #3 Peter and Kyle continued to gel as both hit huge serves to set up the others volley. On return games they crushed the ball through the middle on the service line and then attacked the net together in the 8-5 win and doubles sweep. In singles the Bobcats stayed in the same mode and brought the energy and fight on every court. At #1 Timmy dictated play with his serve and forehand in the 6-3 6-3 win over Sam Wichlin, on of the top players in the region. At #3 Rob played the Atlantic Souths #8 ranked player in Evan Charles. Rob played aggressive and heavy, he attacked on every short ball and gave his opponent no hope in the 6-3 6-4 win. At #5 things started to click for Pierre. Picking up right where he left off in the Washington College match, he hit the ball big and heavy directionally, then attacked with safe targets to the open court. His rally ball is getting very heavy and he didn’t take any points off in his 6-3 6-2 win. It was another great day for the Bobcats as we continue to build with every match. We fought hard at all 9 spots for every ball, for each other, and things went our way on the score cards. If we can keep bringing this level of energy and fight, the Bobcats will be a very tough out for any team to play. This past weekend the Bobcats went to Baltimore for the second straight year to play some teams from the Atlantic South Region. The first match of the weekend was Friday afternoon in against the Washington College Shoremen. Coming off a strong performance against #28 MIT, the Bobcats brought the same energy to the doubles. At #1 Matt and Rob got the first point winning 8-3, returning well and playing very aggressive at the net. At #2 Timmy and Pierre brought their serves and crushed returns at their opponents feet for the 8-4 win. At #3 Peter and Kyle won their second match together. They hit a combined 9 aces as they bombed in serves after getting an early break to take the match 8-4 and give the Bobcats a 3-0 lead. At #1 Timmy had a battle against Kevin Papen, At the end of a long 5-3 game Papen hit a drop shot to take the set 6-3. In the second set Timmy fought back, hitting the ball deeper and heavier, and then attacking the open court. Timmy took the set 6-4 and evened the match. In the third set both players held the first six games with Papen playing tough and Berg serving big. At 3-3 Timmy got the break and didn’t look back from there. Papen held one more time but Timmy continued to bring his serve and dictate with his forehand in the 3-6 6-4 6-4 win. At #2, Matt quickly figured out a winning strategy and executed it perfectly. Hitting the ball high and heavy to his opponents backhand, Matt pinned him in a a corner before attacking the open court taking the match 6-1 6-3. At #3 Rob served big and stayed in an offensive mindset, always looking for a chance to come forward. He chose his spots well and won 6-0 6-1. Like Timmy, Jeff had a long first set not go his way as he fought but came up short 6-4. He never hung his head and continued to attack, closing the net tightly and fighting his best for every ball. He evened things up as he bounced back with a 6-2 second set. For the third-set they played a super tie-breaker. Jeff quickly found himself in a hole down 4-1 as his opponent hit some big serves. But Jeff never counted himself out of it and put continuous pressure on his opponent, forcing him to come up with a big shot. Jeff got a match point and ripped a serve return back for the win 4-6 6-2 10-8. At #5 Pierre stuck to his game plan the whole time. Similar to Rob, he would bring his serve, then hit big and heavy directionally, always looking for the chance to move forward and attack the net. Pierre took the first set 6-2. At this point the crowd was getting big as students were just finishing up their classes for the week and coming over for the match. The extra support seemed to help as Pierre’s opponent came up with some big shots to get out to an early 3-0 lead.But Pierre fought back and continued to rip the ball, hitting his opponent off the court and then angling volleys into the open space. He won 6 of the next 7 games to take the match 6-2 6-4. At #6 Kyle DeSisto beat Kyle Lisco 6-1 6-0. Kyle stood tall and used athleticism to run down every ball as he out gritted his opponent. Overall it was a great day for the Bobcats. We brought high energy and improved in every match in this 9-0 victory and second straight win. The Bobcats took on MIT Saturday after the women’s match to play their fifth ranked opponent in as many matches. As they have done all year, the men came out fired up and with the right approach. We don’t control the outcome but know that if we keep doing the right things like controlling our positive attitude and fighting for every ball that good things will come. Today was the day that everything came together for the men’s team. After 4 matches were we converted a total of 3 doubles wins, the Bobcats executed flawlessly in this one. The energy from the women’s match never left the building and the men picked up right were they left off. At #1 Matt and Rob came out firing and took the first point 8-3. At #2 Timmy ripped every return at the Engineers feet and Pierre knocked off every volley for the 8-1 win. At #3 Peter Yanofsky and Kyle DeSisto were dominant in their 8-1 win. Not only did the big serving pair not face a break point, they didn’t have any deuce games either. The Bobcats energy was through the roof and it was great to put together 3 dominant performances. In singles the men closed the door early as Matt and Rob won at #2 and #3 to give the Bobcats the team win 5-0 and their first win over MIT in 3 years. At #2 Matt played another lefty in Brian Oldfield. Bettles attacked the net and kept his foot on the gas, never slipping up or giving Brian any openings in this 6-1 6-2 win. At #3 Rob took on highly touted first year Eugene Oh. After the strong doubles win, the veteran jumped on his opponent early and like Bettles, gave him no breathing room. Rob ripped the ball from the baseline and set himself up to come forward in his 6-4 6-1 match clinching victory. The MIT team is very skilled and though the match was decided their players continued to fight. At #1 Timmy Berg was upended by Edwin Zhang 6-3 7-6(7-5). Timmy played a good match and fought his hardest but Zhang is equally talented and a remarkable ball striker. He played great tennis and was just too strong from the baseline today. At #4 Jeff Beaton won the first set 6-3 in a grind with fellow senior Sam Harmatz. In the second set Jeff fought for nearly 90 minutes but dropped the second 7-5. Since the match was decided a 10 point tie-breaker was playing in lieu of a third set. Jeff ran hard and gritted out every ball, but in the short set he came up just short 10-8. At #5 Pierre had a similar story. He lost of very close first set 6-4 and then turned things around in the second set. The first-year started hitting the ball higher over the net and created short balls to attack. He executed perfectly and took the set 6-3. In the super tie-breaker his MIT opponent stepped up and took the hard fought match. At #6 Kyle DeSisto also went three sets. He dropped the first 6-3 to the very skilled Curtis Wu before gritting out the second set 6-2. In the tie-breaker Wu got out to an early lead but Kyle came back and took command during the points by coming forward and ending points at the net to win the breaker 10-7. It was a great team win for the men. The amount of work the team is putting in finally indicated itself in the box score. The team is fighting better in every match top to bottom and we are clearly progressing as a unit. The team camaraderie continues to grow and the men will look to build on this match as we head to Baltimore this Thursday for a weekend of tough matches. 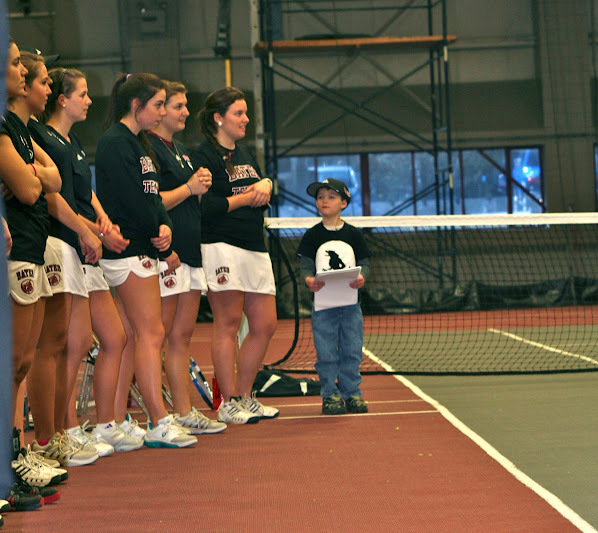 Prior to the Bates women’s and men’s tennis teams’ home matches with MIT, the Bobcats introduced their newest member: 6-year-old Kody Pike, from nearby Livermore Falls. Kody was diagnosed in 2008 with acute lymphoblastic leukemia, the most common type of cancer found in children ages 1-7 years old and the most common form of leukemia found in children. Since then, he has undergone three years of chemotherapy, which he finished in November. Today Kody is learning how to get back into a more typical routine, and that’s where Team IMPACT and Bates tennis come in. Team IMPACT, described on its website as “a non-profit chartered to improve the quality of life for children facing life-threatening illnesses across the Northeast,” matches children like Kody with college athletic teams. The Bates women’s team takes on MIT at 11am, but the introductions beforehand, featuring both teams and Kody, just might be the most memorable part of the day for all involved. This time last year the Bobcats made the trip to MIT for a 9-0 team loss and only 2 Bobcats won 6 or more games in their singles matches. On paper this year’s match should have been similar. On paper, MIT brought in the nations #7 recruiting class and boasts a line-up with 15 stars (according to tennisrecruiting) compared to the Bobcats 3. Luckily matches are not played on paper and this years Bobcats team is something special. Coming off a big win over Babson the Bobcats had the energy and confidence needed to hang with a team of this caliber. Play started off with doubles and it was 8-4s across the board. We fought well at every spot and the team did a great job cheering for each other and staying positive. The amount of work dedicated in practice to doubles paid off as the girls executed to take #1 and #3 for the 2-1 lead. 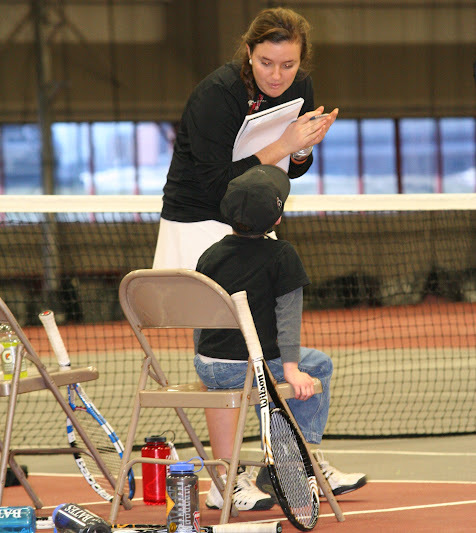 Playing indoors on the four Merrill courts, the singles was intense from the start. At #1 MIT claimed the first set 6-0 as Lauren Quisenberry put on a dominating display with her forehand, hitting winners from all over the court. At #2 Meg also dropped the first set in a long 6-3 set. At #3 Jacqui also dropped her first set in a 90 minute 6-4 grind. At #4 Erika kept the Bobcats in it by taking her first set 6-3 after a slow start. The Bobcats do not quit. They play with heart, till the end, and for each other. At #1 Elena was down 6-0 4-0 in what was almost MIT’s second point. At this point she dug in, she scrapped for every ball, and out gritted her opponent, point by point, game by game. 30 minutes later Elena had fought off 2 match points and had pushed the match to a tie-breaker. The first year was clutch and gutted out the set 7-6 7-4. The third set was all Elena as she worked for everything and ran every ball down for the 6-1 third set win over the All-American. As Ellie was making her comeback Meg and Jacqui were doing the same thing at #2 and #3. At #2 Meg put on a great display of senior leadership. She stuck with her game plan to attack the net and out willed her opponent in the second set where she also fought off match points and won it in a tie-breaker 7-4. At #3 Jacqui used her speed and consistency to fight her way back into the match. She ran every ball down and refused to miss, remaining more steady and putting in more work than her opponent would for the 6-3 second set. At #4 Erika beared down and refused to give her opponent and wiggle room. The senior kept her foot on the gas and gutted out all of the big points to make it a 4-1 Bates match with a 6-3 7-5 win. At this point all matches were on as #5 and #6 filled in on the open courts with the Bobcats needing one more win for the team victory. At #2 MIT made a push as Anastasia Vishnevetsky was able to outlast Meg 6-3 in the final set where both put on a great match and Meg’s fight was awesome the entire time. MIT made things even closer when they won at #5 to push the match to 4-3. At #3 Jacqui stepped up and out gritted her first year opponent in a 3 hour 45 minute display of toughness. Both girls fought well but in these never ending points, Jacqui stayed disciplined and never went for too much or tried to force the issue. When her opponent would get tired, Jacqui’s conditioning paid off and she gutted out the 5th point with a 6-4 third set win. At #6 Lucy remained a rock for the team, winning 6-1 6-3 and putting the icing on the cake for day. She imposed her will and was able to attack the net and continues to improve with every match. This win today was a big one for the team and the result of controlling the things we could control, such as our fight, our positive attitudes, and our enjoyment of competition. The work is paying off and not only are the tennis skills improving, but the mental aspect is getting better every day. The Bobcats are now 6-3 and should be receiving national recognition in the next team rankings. On Wednesday the Bobcats made the trip to Babson for what was sure to be tough match. Our last few matches with them have been 5-plus hours and this time would be no different in a very hard fought match. Both teams came ready to play and the doubles was high intensity from the beginning. Babson got off to a hot start and was up 6-4 at #1 doubles, 7-2 at #2, and 7-4 at #3. It looked like we could be in a 3-0 hole heading into singles but the Cats kept their composure. Nobody got down on themselves and the women had fun fighting for every ball, running and competing as hard as they could for their teammates. It worked. At #1 Meg and Ellie gritted out 4 straight games and the first point of the team match 8-4. At #2 Nicole and Ashley won 6 straight games to make it 8-7 before the Beavers held and pushed the match to a tie-breaker. At #3 Lucy and Jacqui erased their 7-4 deficit and also pushed their set to a tie-breaker. At #2 and #3 we really competed well to get back into the match and were able to win the tie-breaker at #3 7-5 to give the Bobcats the lead 2-1 heading into singles. In the team talk after doubles and before singles there was a new energy in the air. The comebacks at all 3 spots and fight the women had put into the match had given them a new level of confidence. We were competing as a team the best we have all year, and having fun doing it. At #1 singles Ellie put the Bobcats up 3-1 with a 6-1 6-4 win before Babson tightened up the match winning at #2 and #3 in two very close matches. Lucy Brennan broke the tie by winning at #6 6-1 6-0 in a great performance. She executed her game plan by attacking the net, mixing up short chips with driving approach shots to finish points off with a soft volley to the open court. Up 4-3 there were two matches left both in third sets. At #5 Audrey Grauer took on Beaver Monica Mercer in a 3 hour 45 minute match. The experienced Beaver was able to take the first set 7-6 (7-5) from the first-year. In the second set Audrey fought back and did a great job attacking the net and her aggressive play earned her a 6-4 second set. In the third set Audrey battled not only her opponent but also the sunset as the match wore on. Every game went to deuce and the rallies seemed to be never ending as both players tested the others will power and patience. In the end the seasoned veteran took the third set 6-4 but Audrey did fought her best and it was just the difference of a couple points. With the match tied at 4-4 Erika Blauth was in a third set battle of her own against first-year stand out Minte Tamoshunas. Erika had taken the first set 6-4 by dictating with her forehand and crushing the ball through the middle. In the second set Minte was a little more consistent and was able to force a third set winning the second 6-4. In the third set Erika did everything we could have asked of her. She stayed positive after dropping the second set and continued to fight for every ball. She rose the level of her game and while she continued to crush her forehand, was also patient when attacking the net and chose her spots better. She executed flawlessly and the captain lead by example, winning the third set 6-2 and sealing the match for the Bobcats who improve to 5-3 on the year.